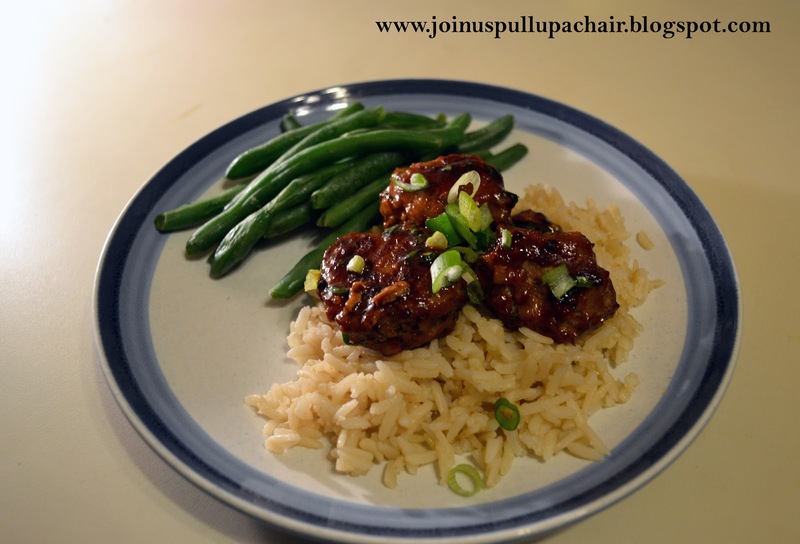 Once again, I’ve been craving Chinese food and these meatballs did not disappoint! I saw the picture of these meatballs posted on Pinterest – notice my new button on the right, you can easily follow me now! The hoisin glaze is amazing and I plan to double the recipe next time since it was so good and I like my meatballs with a lot of sauce. I was hesitant to make these since one the ingredients were water chestnuts and my husband despises them. I told him that it’s not like he’d be eating huge pieces of it that I’d cut them small and it would add crunch to the meatballs. I’m so glad he was willing to try them and both he and my daughter loved them! This is definitely another keeper recipe and would be great to make as appetizers for a party! In a large bowl, combine the soy sauce, sesame oil, ginger, red pepper and sugar. Whisk in cornstarch until smooth. Stir in the 2 scallions that were minced and water chestnut. Add the ground turkey and combine well to incorporate all the ingredients. Drop the turkey mixture in rounded tablespoons onto the prepared baking sheet. Lightly coat the meatballs with cooking spray and transfer to the oven. Bake until the meatballs are completely cooked through, approximately 15-20 minutes depending on the size. While the meatballs are cooking, make the hoisin glaze. In a large bowl, combine the hoisin, cilantro and lime juice. Add the hot meatballs and gently stir to combine. Serve over brown rice and sprinkle the remaining sliced scallions over the top.